Two weekends ago, Richard was away (enjoying the Oktoberfest festivities in Germany, no less! ), so the girl and I were on our own. I love our weekends as a family because our weekdays are so hectic, so I was a little sad when I woke up on Friday morning knowing that we wouldn’t see Richard again until Sunday night. In a daze of melancholy and exhaustion, I grabbed the video monitor and saw the girl squirming in her cot and making her usual morning hey-Mom-I’m-here noises. I wandered over to her room and she greeted me with a smile, as she does every morning. When I saw that smile, the sadness didn’t linger and my heart was bursting as I smiled back at her and said, “Good morning, sweet girl.” After I picked her up, we opened the brightly-colored curtains and she waved out the window whilst I say, “Hello, world, we’re ready for another day!” We walked into the hallway where she continued her waves at a photo frame full of pictures from our wedding before we head back to my bed where I breastfed her then we snuggled for a bit. I’d love to say that the rest of the morning was fabulous, but in all honesty, it was a little rough and I just felt off. Our girl is teething something fierce plus she is in a major growth spurt (or leap if you follow Wonder Weeks, which I highly recommend for any new parents, as it has been pretty much spot on for us). Right now, she is in a weird phase of high-pitched screaming, which is extremely odd for our smiley, laid-back girl. It is seriously ear-piercing! This was one of those days where I felt super sorry for myself that we live thousands of miles away from my family. All I could think about was how badly I wished I could drive to my parents’ house and lounge in the living room with them whilst they swooned over their granddaughter. Also? I wanted someone else to cook for me. And? I wanted to avoid the overwhelming pile of laundry from our trip to the States. I knew, though, that for the sake of our girl and her mood that I needed to snap out of this funk. When she went down for her morning nap, I decided to crawl back into bed and basically start the day over again after both of our naps. Honestly, this was the best decision I could have made. I woke up refreshed and ready to enjoy every moment of our girls’ weekend. Over the next couple of days, I focused on spending quality time with my favorite girl. There were moments, like when we went to the park on Sunday and she loved every second I pushed her in the swing, that I wished Richard was with us to see the joy on her face. But, that weekend made me so grateful for our daughter and for our little family. That weekend reminded me of so many things that I needed to remember. That the three of us are better together and that we have the most fun then. That we are incredibly blessed to be able to raise this sweet girl and to say that we are her mom and dad. That despite the miles that separate us from my side of the family that this is our home and it’s a place where I feel fortunate to live. That there are tough times, but really there are so many more amazing times. That I love that I have the opportunity to stay at home with our girl during these early years of her life. That even though Richard and I both like to have time away with our friends that we both come back from those times being even more grateful for our life together. That despite the fact that Richard and I have an extremely strong marriage we know it is still a constant work in progress. That he is, without a doubt, my best friend. That this life we have is pretty darn amazing, and I’ll take the good and the bad any day knowing that I have these two beside me. So, the weekend that started with me feeling down about just about everything ended with me being reminded of what is important and of how fortunate I am. I’m so glad I chose happiness and positivity and to enjoy every moment of the weekend I had with our baby girl. Have you ever wanted to start a day over again? Ever had one of those days/weekends/weeks where you are reminded just how fortunate you are? Look at that face! 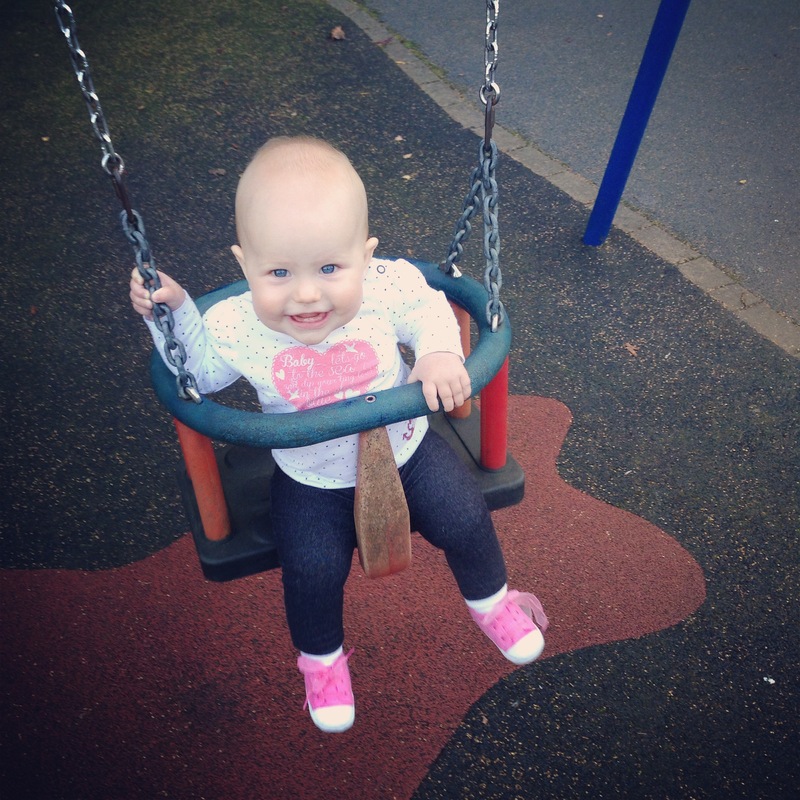 I love how she holds on to the swing…ah, my heart.